And so ends another Baking A Difference session in one of the many care settings we’ve visited working in partnership with Michelle Stratford of Planet Leicester Bakers. 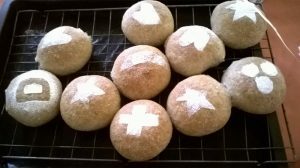 Since taking on the role of Project Coordinator in January 2019, I have been constantly surprised at how well the bread baking sessions have been received by both residents and care staff alike. From learning about the science of proving yeast, to mixing and shaping dough, to enjoying fresh bakes with butter and jam it’s been a delight to see such enthusiasm shown by all participants. 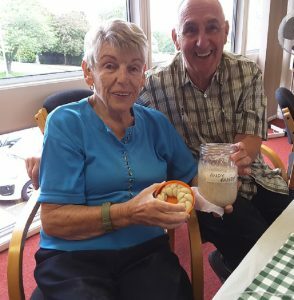 It’s also wonderful to witness the profound sense of wellbeing our bread-making activities bring; gently exercising hands, relaxing the mind, evoking memories openly shared, often over our half-time cup of tea. As the project moves forward I’m looking forward to capturing this companionship by connecting residents with others in their local community and bring people together to share in the beauty of bread. We have been working with a range of interdisciplinary professionals to pilot an action research project called Better Visits. Better Visits aims to improve the experience that relatives have when going to a care setting to see their loved ones with dementia. The plan is to pilot creating and using a resource in one care setting based on what existing visitors tell us what challenges they face when visiting and what could potentially enhance this for them. We are delighted to share that we have now got ethics approval from De Montfort University for our questionnaires for relatives and friends who visit loved ones in care settings and that these will hopefully be going out to over 100 people during February. We will then be able to gather information, as well as to offer one-to-one meetings and focus groups sessions as best we can to learn about the challenges faced and the support required to ensure that older people and their loved ones can have better visits. We are delighted to be able to undertake this work with the fantastic group of like minded people from different organisations. A chance conference sitting on a great table turned the original idea into the proposal that won funding back in July 2017. 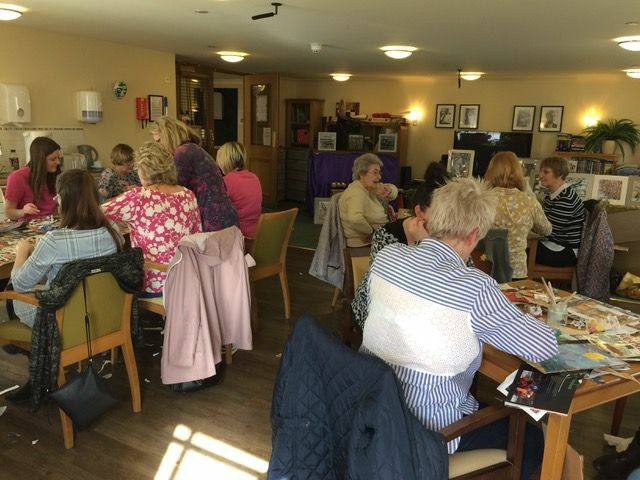 In order to build a network of mutual support and ideas sharing, L4A has been working to engage with, listen to and understand the needs and wants of Activity Coordinators working in care settings locally in Leicester and Leicestershire. 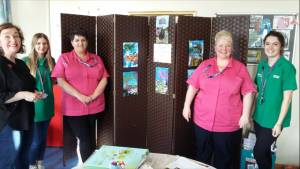 We are keen to support Activity Coordinators in finding effective, creative and supportive techniques to use with the older people they care for, to overcome some of the challenges faced by care home residents. This includes sight loss, hearing loss, frailty and limited dexterity. We held an Active Listening session in September, which was run by Ali Sinclair. This explored active listening skills together, including barriers which can prevent such listening from taking place (for the speaker as well as the listener) and sharing ideas on how these can be overcome. 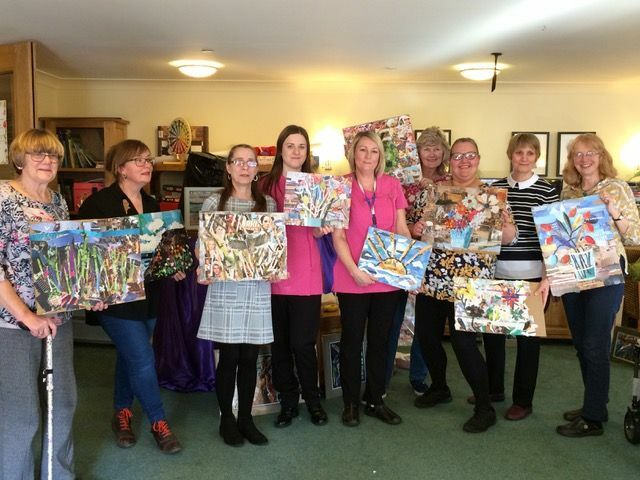 We also held an ‘Art for Non Artists’ course in November. 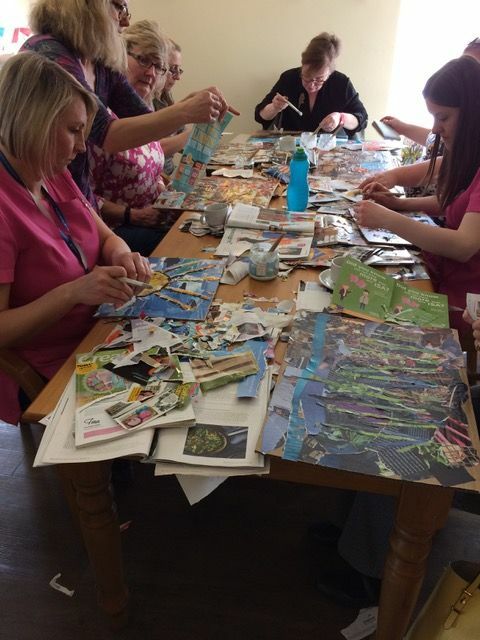 As well as exploring a range of art materials and ideas and giving the opportunity to have a go, Rowena Williams talked about why art activities matter, how they can be adapted for mobility or cognitive issues and how to make the most of resources and buy knowledgably – really important for those on a tight budget. 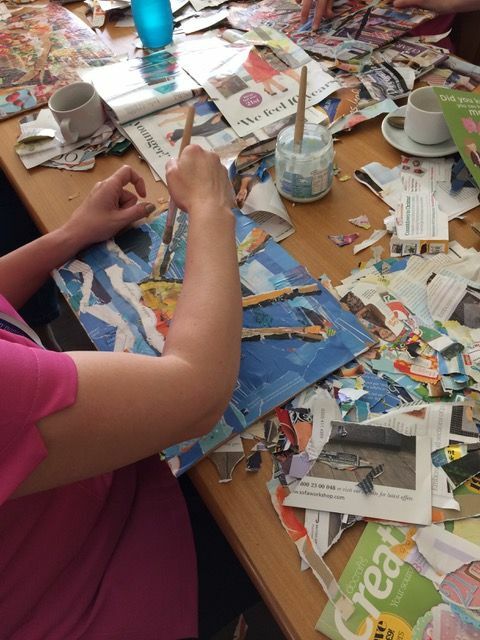 We plan for the remainder of the sessions to cover themes such as poetry and music, multi-sensory activities and a follow up to the very successful art workshop, this time focusing on a craft theme. We will also want to bring all the learning into an on-going accessible resource, although we are finding that the activity coordinators themselves are the best possible resource! 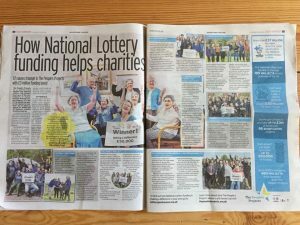 We were featured in the Daily Mirror on 10th May with our Baking a Difference funding win. Here is a link to the article and below are photos of this page. We also featured in the local paper, the Leicester Mercury, on the same date and photos of this feature below too. 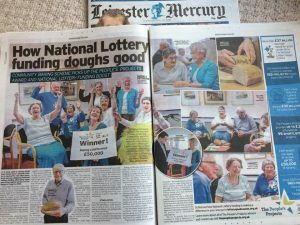 Thank you to both publications for focusing on positive news stories from care settings for older people and for sharing the great news about our charity winning £50,000 of funding to “dough good” work with! What Next for Baking a Difference? Baking a Difference started last year when L4A received a small amount of funding from Awards for All to trial it in three places, Wyggeston Hospital, Harley Grange and Scraptoft Court. “And it was absolutely fantastic,” says Fiona. “The principle is that through creative bread making sessions it brings people together. It sparks conversations, it keeps hands and minds busy, it offers physical activity and fun. It has something for everybody. People have a choice to be involved however much they wish, whether it’s in helping to make the bread from the start – or just eat it. “We worked with a professional baker to offer group sessions, going through the process from the grain to the table. The baker, Michelle Stratford from Planet Leicester Bakers, would provide dough each week, and also look at a different part of the bread baking process. She even set up experiments, for example, to show what happens when fermentation creates gas, putting a balloon over a bottle to see it blow up. “Bread baking appeals to many senses, from the smell to the touch and feel with kneading the dough and, of course, the taste when the bread is baked. Over the weeks interest grew. Fiona continues: “Some might have noticed sessions going on in the first week but not participated, in the second week they might have ‘come a little closer’ and enjoyed eating the bread and by the fourth week they were in the middle of it all! “It got people talking about so many memories – the bread strikes, how their mothers used to make bread and the whole essence of family life really. 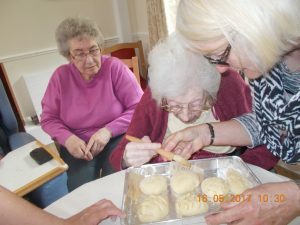 The £50,000 will help to widen the project to other care homes and sheltered housing in Leicester and Leicestershire and pay for the time and materials of the professional baker, as well as train and mentor volunteers from the community to offer Bread and Conversation sessions, so that the project has a sustainability and longevity. “The idea will be to bring people into the homes and create ties with the community,” adds Fiona, “to create bonds of friendship and reduce any feelings of loneliness, isolation or boredom. 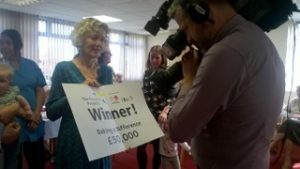 We won £50,000 with your help. Thank you so much! 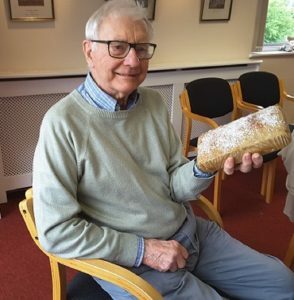 Baking a Difference is a project pioneered by L4A to bring older people in care homes and sheltered housing together with local communities, using bread baking activity. 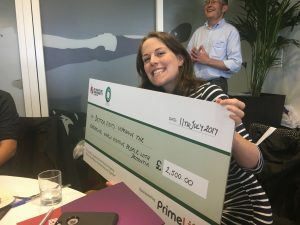 Following public voting the project has been awarded £50,000 from The People’s Projects and L4A’s project manager Fiona Smith couldn’t be more delighted. “It is exceptionally lovely to have been chosen and voted for,” says Fiona. “There was a huge cheer when we found out we’d won. It is amazing how word can grow for an idea and we are really grateful to everyone who backed us. 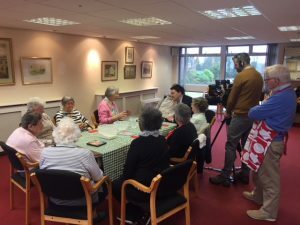 L4A is really excited to be one of the five organisations shortlisted in the Central East ITV region to compete for £50,000 in this years Peoples Project competition. This is being decided by a public vote online and we would very much like your vote! 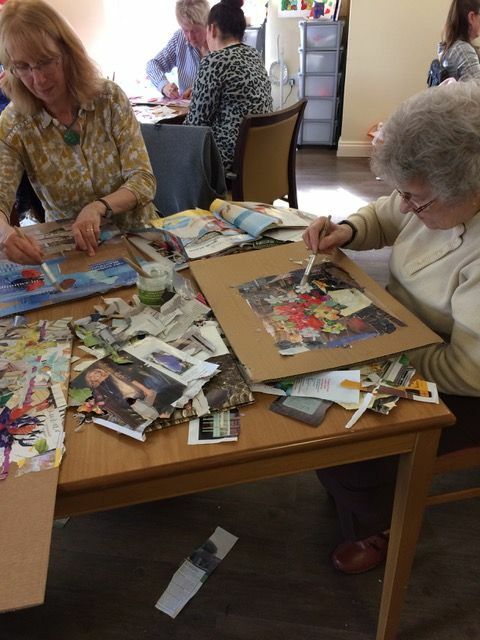 We want to help ease the feelings of loneliness and isolation that older people in residential care can experience – and bring some of the outside world in to them. 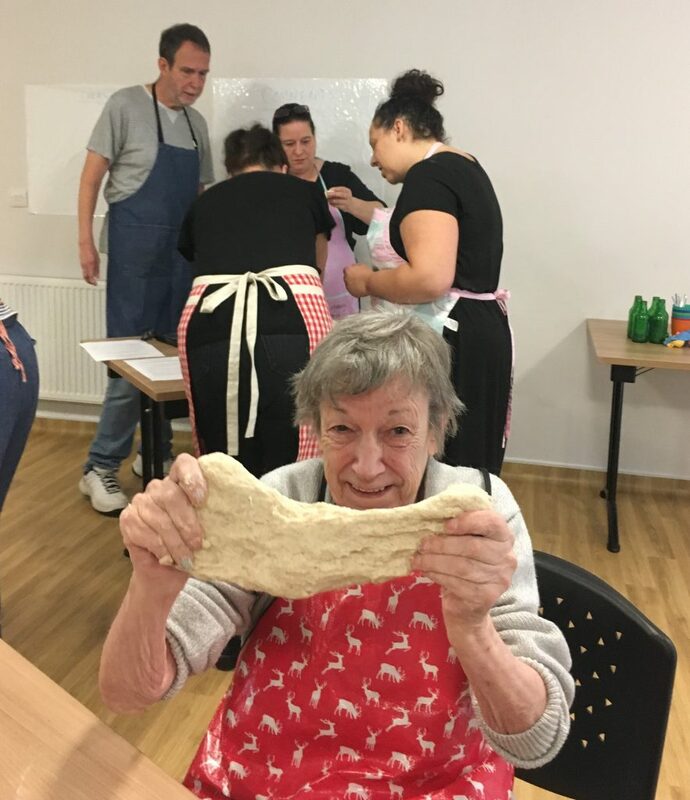 We could win £50,000 for our ‘Baking a Difference’ project; taking participative bread making into care homes and sheltered housing and involving the local community as well with regular ‘Bread and Conversation’ sessions. We are going to be featured on the ITV Central 6pm News tonight, at some point between 6 and 6.30pm. (The film is also available to watch online here). Voting is open now and runs through until Monday 30th April at 12 noon. It would be great if you could help – we need as many votes as possible, so please do feel free to pass this on to your friends and family, like us on Facebook or retweet us as much as you can!!! L4A is really excited to be one of the five organisations shortlisted in the Central East ITV region to compete for £50,000 in this years Peoples Project competition. This is being decided by a public vote online HERE and we would very much like your vote! Voting is open from Monday and runs through until Monday 30th April at 12 noon. It would be great if you could help by voting for us. We will need as many votes as possible, so please also pass this on to your friends and family. You could also help us out by liking us on Facebook, sharing our posts and retweeting us on Twitter us as much as you can! THANK YOU! Our pitch for your vote will be shown on Central East ITV news between 6pm and 6.30pm on Monday 16th April 2018.